I love this bike, so was very sad to find a crack in the frame! This is no small crack, it goes allll the way around the back. This frame is done. 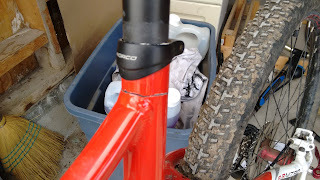 It sounds like the frame warranty will take care of it, but I will know for sure next week. UPDATE: Warranty will cover it. Thanks Norco! 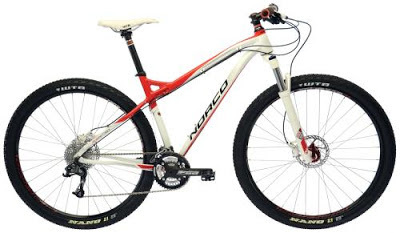 Frame has been ordered, just waiting and riding a cheapo replacement bike I bought to get through the fall... more on that later! For now I just want to complain about the design... it's not just this bike, it's a lot of mountain bikes these days. They have top tubes that slope down so far, and then a stubby little bit of seat tube above it. This results in a big long chunk of seat post sticking up beyond the frame. Seat posts have a "minimum insertion point" to make sure there's a lot of seat post in the seat tube. I had more than the minimum inserted - well over an inch, probably more. So should have been fine. But I'm fairly tall and not all that light (185lbs neighbourhood) so that's a lot of weight to have moving around on that seatpost. By it sticking out this far it creates leverage that presumably eventually caused the seat tube to fatigue. It shouldn't, as long as the "minimum insertion point" is met, but here we are. Hopefully they do right by the warranty and I get a nice shiny new frame!